Many careers in pharmaceuticals manufacturing begin in the production department. 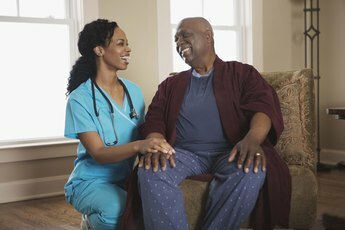 For people who want to make a living helping people to feel better, pharmaceutical manufacturing offers plenty of career opportunities. From technicians who supervise lab experiments to systems managers who track supply problems, pharmaceuticals makers employ a variety of professionals. Careers in quality control and administration are options, as well. Virtually any career in the sector promises growth: Numbers from the U.S. Bureau of Labor Statistics project that medical science, including pharmaceuticals manufacturing, will be one of the fastest-expanding industries through 2020. Many employees begin their careers in entry-level production jobs. A starter position might be biological or chemical technician, operating lab and processing equipment and recording data from experiments. 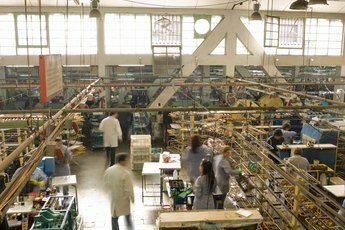 Instrument technicians test and repair manufacturing equipment. 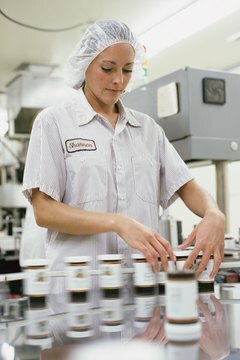 Packaging operators label, inspect and pack products. For technicians who want to stay in the lab, assay analysts handle and track cell cultures. 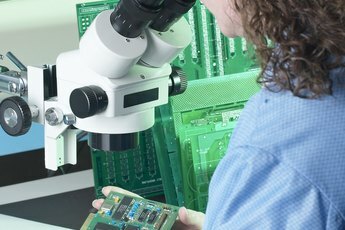 Educational requirements vary from a high school diploma for packaging operators and assay analysts to an associate degree in electronics or science for technician jobs. Certificates and associate degrees in pharmaceutical manufacturing teach students to set up and operate equipment to control temperature, pressure and other production factors. To ensure that drugs meet safety standards, pharmaceuticals makers hire quality control workers. Positions include quality control analyst, responsible for analyzing raw materials and testing procedures for abnormalities, and quality assurance auditor, who monitors production for compliance with company standards and good manufacturing practices. Environmental health and safety specialists concentrate on compliance with workplace safety laws that protect employees from exposure to toxic materials and other industrial hazards. Quality assurance jobs require at least a bachelor’s degree in a science major. Pharmaceuticals makers need engineers at every step of production. Engineers design and oversee building of factories and the processes that take place in them, including packaging. Plus, they develop drug-delivery and dosing systems and technologies to keep production fields sterile. Chemical engineers produce pharmaceutical compounds and monitor and assess chemical-processing techniques. Bioprocess engineers test how chemicals interact, and develop formulations for production. Pharmaceutical process engineers design, modify and maintain manufacturing equipment. Engineers should have at least a bachelor’s degree in engineering. Pharmaceuticals plants employ non-science majors in management and administration. They need people in project management, finance and human resources. Plus, there are opportunities in pharmaceutical systems management, or technical management, in positions such as project leader or associate director. Systems management workers use software-based analysis to model the supply chain and spot supply bottlenecks and cost factors. Managers usually must have a bachelor’s degree, though systems managers and engineers may need a master’s degree for higher-level positions. Regardless of specialty, workers in pharmaceuticals plants should see job growth. The BLS projects the number of jobs in medical science, including pharmaceuticals development and manufacturing, to increase 36 percent from 2010 to 2020, well above the 14 percent average forecast for all U.S. occupations. The agency credits job gains to new medical research into diseases such as AIDS, cancer and Alzheimer’s, and the growing reliance on therapeutic drugs to treat illnesses in an expanding and aging population.